The Tomb of the Unknown Revolutionary War Soldier - Washington Square Park - Philadelphia, PA, USA. "IN UNMARKED GRAVES WITHIN THIS SQUARE LIE THOUSANDS OF UNKNOWN SOLDIERS OF WASHINGTON'S ARMY WHO DIED OF WOUNDS AND SICKNESS DURING REVOLUTIONARY WAR." "THE INDEPENDENCE OF LIBERTY YOU POSSESS ARE THE WORK OF JOINT COUNCILS AND JOINT EFFORTS OF COMMON DANGERS, SUFFERINGS AND SUCCESS. - Washington's Farewell Address, Sept. 17, 1796." "THE ETERNAL FLAME DEDICATED IN 1976 BY CONTINENTAL BANK IN MEMORY OF THOSE WHO FOUGHT AND GAVE THEIR LIVES SO THAT WE MIGHT CELEBRATE OUR 200TH ANNIVERSARY AS A FREE PEOPLE." 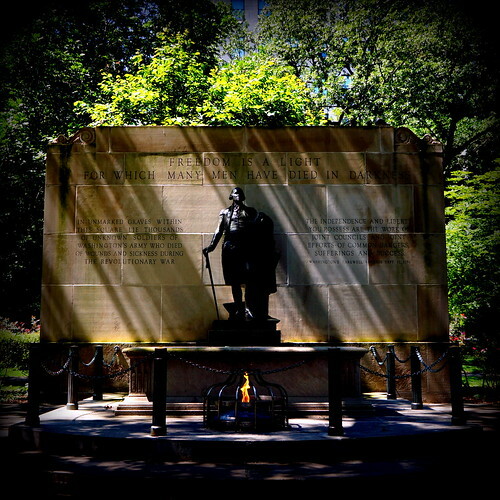 "THIS MONUMENT together with its COURT OF FLAGS, the FOUNTAIN and the COLONIAL WALL surrounding the SQUARE were made possibly by the generosity of many interested business firms and individual friends of WASHINGTON SQUARE.